Three years ago, the eastern monarch butterfly population plummeted to 35 million, a drop of more than 95 per cent since the 1990s. More than a billion milkweed plants, which monarchs depend on for survival, had been lost throughout the butterfly's migratory range -- from overwintering sites in Mexico to summer habitat in Canada. A lot has changed in three years, but there's still more work to do if we're to save the ailing monarch population. Three years ago, the eastern monarch butterfly population plummeted to 35 million, a drop of more than 95 per cent since the 1990s. 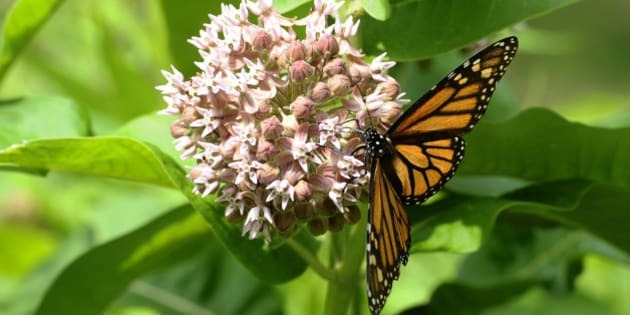 More than a billion milkweed plants, which monarchs depend on for survival, had been lost throughout the butterfly's migratory range -- from overwintering sites in Mexico to summer habitat in Canada. We needed more milkweed in the ground, quickly. But many provinces and states listed the plant as "noxious", and few nurseries and garden centres carried local "weeds". A lot has changed in three years. The David Suzuki Foundation launched its #gotmilkweed campaign in April 2013 to encourage Toronto residents to plant milkweed in yards and on balconies. Foundation volunteer Homegrown Park Rangers also planted milkweed in local parks and schoolyards. The Ontario government pulled the plant from its naughty list and media stories about the monarchs' plight took flight. By winter 2015, the #gotmilkweed campaign had inspired more than 10,000 milkweed plantings in Toronto, with another 11,000 people across the country pledging to help monarchs via the Monarch Manifesto. This week, the 2016 #gotmilkweed campaign launched, offering milkweed plants in Toronto and Montreal and seed packets for the rest of the country. As author and urban gardening guru Lorraine Johnson noted, these and other campaigns have made milkweed the hottest native plant on the market. How are monarchs doing? Last month, Mexican authorities estimated the population that survived the epic 5,000-kilometre journey from Canada and the U.S. Midwest last fall was three-and-a-half times greater than the year before. Media across the continent ran stories about the comeback. Then the weather turned. The worst winter storm in more than 30 years hit the mountainous forest where eastern monarchs overwinter, killing as many as 11 million. Scientists worried the damage would be even greater, such as in 2002 when a storm wiped out more than 220 million monarchs. According to a recent study by the Scripps Institution of Oceanography at UC San Diego and U.S. Geological Survey, published in Scientific Reports, eastern monarchs face a significant risk of extinction, with quasi-extinction -- when so few are left that recovery is impossible -- occurring over the next 20 years. Severe weather is a major threat to monarchs, from winter storms in Mexico to scorching summer droughts in their breeding grounds. Near eradication of milkweed along parts of their migratory route is an even more pressing concern. Milkweed has long been found in roadsides, ditches, medians, meadows and fields. But sprawling development coupled with a dramatic increase in use of the herbicide glyphosate (Roundup) has killed tens of millions of the plants. No one knows what the future holds for monarch butterflies. But there's reason to be encouraged. U.S. federal agencies have offered millions in funding, and dozens of government agencies and conservation groups are working with projects like the Monarch Joint Venture. The U.S. Environmental Defense Fund is developing the innovative Monarch Butterfly Habitat Exchange, allowing landowners to get paid for opening marginal land to butterflies. In Canada, while the federal government remains quiet, a handful of researchers and municipalities -- and thousands of concerned individuals -- are leading the charge. Since last fall, the David Suzuki Foundation has worked with University of Guelph conservation biologist Tyler Flockhart to assess how to best manage linear infrastructure corridors -- transmission lines, railways and highways -- as potential "butterflyways." We hope the results will help establish best practices and make an economic case for boosting milkweed and monarchs throughout North American corridors. Many cities are aiming to make space for bees and butterflies, but the City of Markham wants to become one of the most monarch-friendly municipalities on the continent. This winter, the Ontario city committed to creating the world's first municipal milkweed nursery, in partnership with the David Suzuki Foundation. It recently became the first Canadian city to sign a mayoral monarch pledge, and has started posting "butterfly parking signs" in city parks. Although milkweed is spreading and monarch numbers have bounced back from historic lows, the population remains more than 80 per cent lower than 20 years ago. This summer, the great-grandkids of butterflies we welcomed last year will return to Canada. I encourage you to continue bringing them home, one milkweed plant at a time. Written with contributions from David Suzuki Foundation communications strategist Jode Roberts.